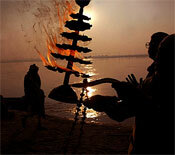 The grand Hindu religious fair, Kumbh Mela, is held every four years. But did you know that a smaller version of the Kumbh Mela is annually organised in Allahabad in North India? Scroll down and read all about the Magh Mela, the mini Kumbh Mela that is attended by thousands of pilgrims every year. If you like this article on Magh Mela, just click here to refer this page to your friends and dear ones. Hope you have a great time with TheHolidaySpot! In accordance with the traditional Hindu calendar followed in North India, this holy fair is organised every year during the Hindu month of Magh (corresponding to mid January - mid February of the Gregorian calendar); hence the name. The Magh Mela is, however, not confined only to the month of Magh and the important bathing dates are spread over a period of 45 days. The Magh Mela is actually a smaller version of Kumbh Mela. Hence it is also known as mini Kumbh Mela. Every year, the Magh Mela commences on the day of Makkar Sankranti in January, which is the first important bathing day according to the religious Hindu calendar. It begins with multitudes of pilgrims taking a holy dip at the Sangam on auspicious dates. A large number of people arrive here annually and stay in makeshift houses or tents at the Sangam, spending the entire month of Magh in prayers. This period is known as "Kalpvas". Those who religiously observe the "Kalpvas" are known as "Kalpvasis". The ancient Hindu Vedas mention a "Kalp" to be the period equal to the total number of years in the four yugas - Satyug, Treta, Dwapar and Kalyug. This adds up to several millions of years. It is said that by piously observing a "Kalpavas", a devotee overcomes the sins in his/her previous birth and escapes the cycle of Janma(birth) and Karma (actions). During each day of the Magh Mela, a Kalpvasi has to take a dip at the Ganges on sunrise praying to the rising sun. Majority of the Kalpvasis partake only a meal a day. After observing 12 Kalpavas, a Kalpavasi has to donate his/her bed and all his belongings (a ritual known as "Shayya Daan"). The Uttar Pradesh government annually makes special arrangements for the devotees during this time. A greater number of buses ply to let the pilgrims have their journey in peace and without any inconvenience. A township of tents specially come up on the banks of the Sangam to provide shelter to the visiting millions who turn up from all over the country. Adequate medical and security arrangements are made to avoid any untoward incidents. "Lost and Found" camps are also set up and manned by the local police to prevent anyone getting missing during the days of the fair. Every twelfth year, the Magh Mela is transformed into the Kumbha Mela. Uttar Pradesh is flooded with millions of pilgrims who arrive here during this time to attend this grand event. In 2009, Magh Mela commenced on January 11 and ended on February 23.